Over the holidays, Bridgeen of Cherry and Cinnamon and I worked out a little private swap. (If you remember, our artwork was in a show together out in Seattle.) Her work is pretty amazing. I love how the Internet facilitates exchanges of this type, and I also love waiting for an opening packages! Being that I’m still completely obsessed with stem stitching in very pale icy blue/greens, leaf shapes and french knots, I made her a little wintery tree piece from one of the embossed pages in the front of a poetry book. A bit like a plant growing out of the embossed seal. And how great is that embossed detail? It was one of the reasons I ended up buying this particular book. The color is a bit hard to capture on camera, but I used DMC 3756 which is very light and ever so slightly blue. She sent me a completely awesome portrait of Paul Rudd (because I adore him). Read her post here about it! For the latest Phat Quarter swap I created this piece for Rebecca (aka hugsarefun) loosely based on an image of a carved sandstone screen I came across in one of my many trips around the internet. I knew that I wouldn’t be able to come close to reproducing the level of detail that was in the carving (isn’t is just wonderful, by the way?) 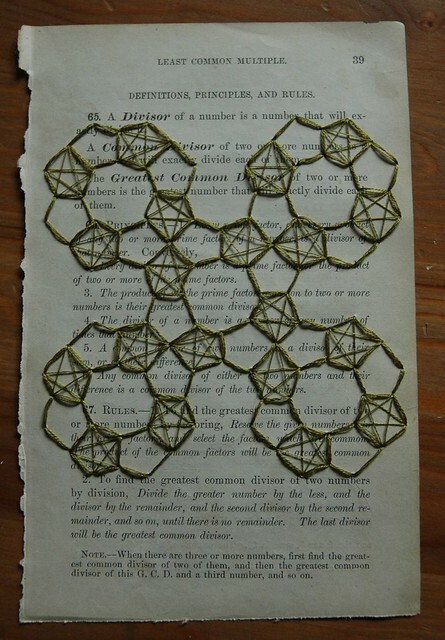 but I knew I could emphasize the pentagons and add a few levels of “five” (aka the theme of the swap) to the piece. I had actually picked out a different piece of paper to use for this but I ripped the darn thing. Ah well. This one worked out just fine. This was really fun to put together. 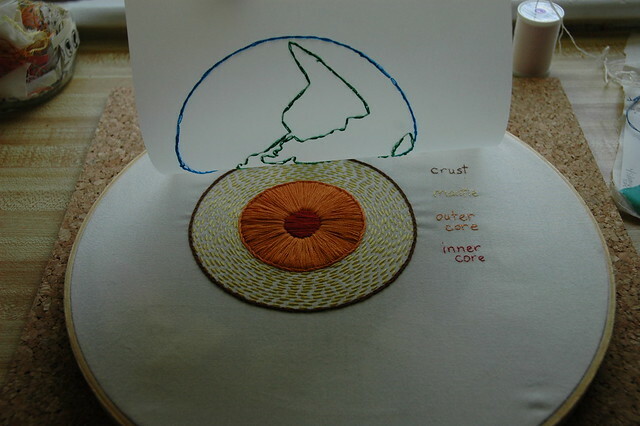 The Earth is based on this illustration by Wild Olive (with some adjustments). When I was little, we had this set of World Book Encyclopedias that had these really detailed, acetate/transparency inserts that were layered and showed things like the inside of a frog, or the human head, skull, brain, muscles etc. 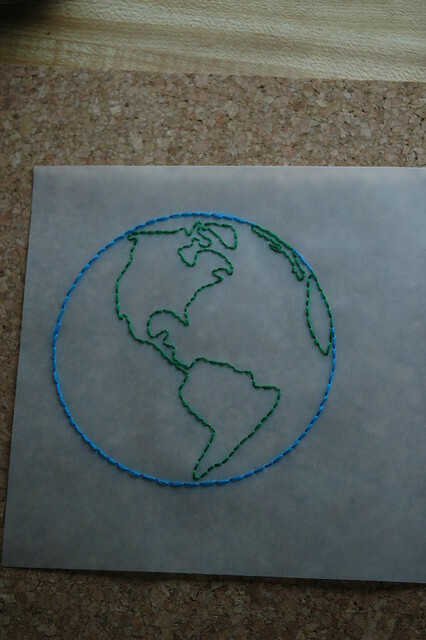 I thought I’d try and accomplish something similar, but simplified. I’m quite pleased at how well it turned out. 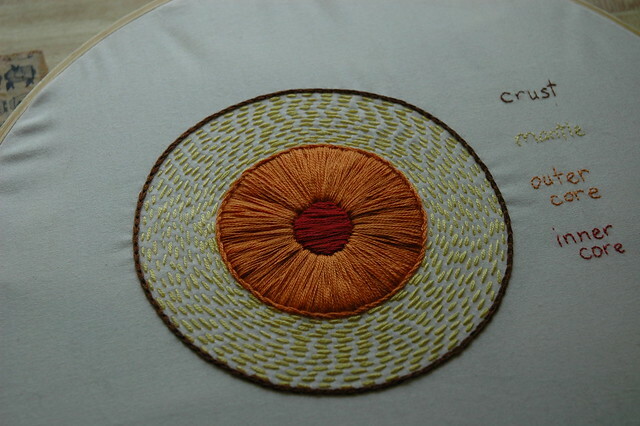 I had planned on satin stitching the yellow as well, but after using almost a full skein (with just a tiny bit left over) on the orange, I didn’t want to chance not having enough for the yellow ring. I like the way it turned out regardless. 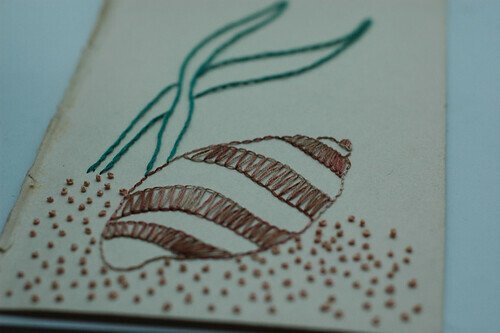 I loved combining embroidering on fabric and embroidering on another surface. I might just do it again sometime. My Tiny Things swap piece made it across the ocean to SisterTwisty. 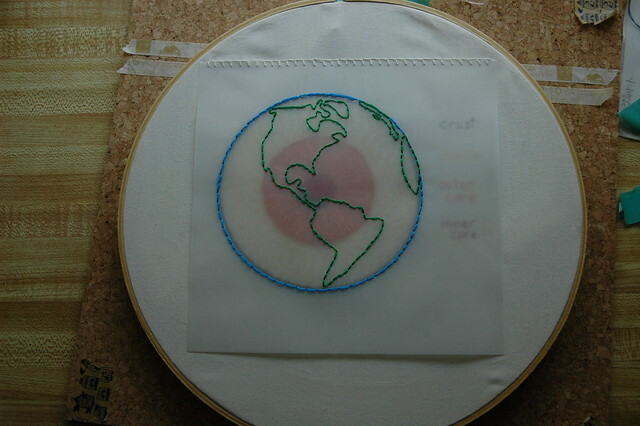 How funny that she stitched up an ocean-themed piece, too. 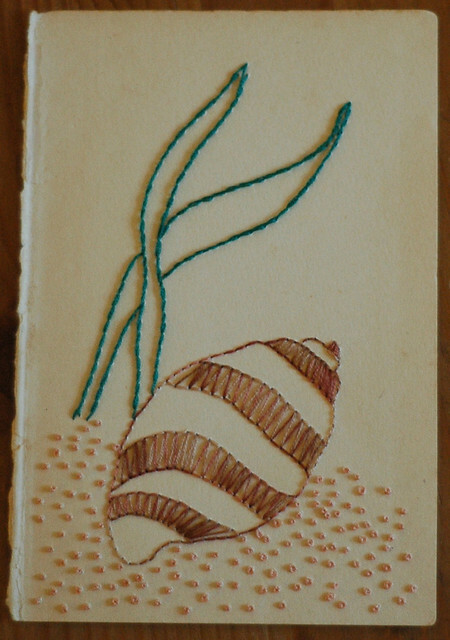 I had a lot of fun with this one, I’m quite happy with the effect of the variegated floss on the shell. 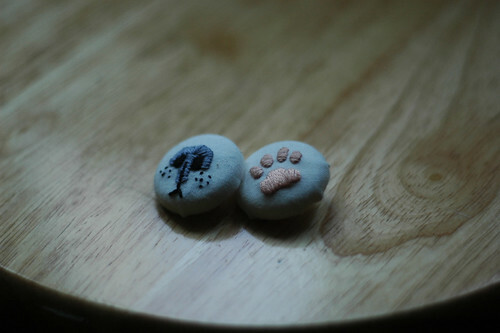 Plus two little cat-themed buttons. My swap piece successfully arrived in New York today. 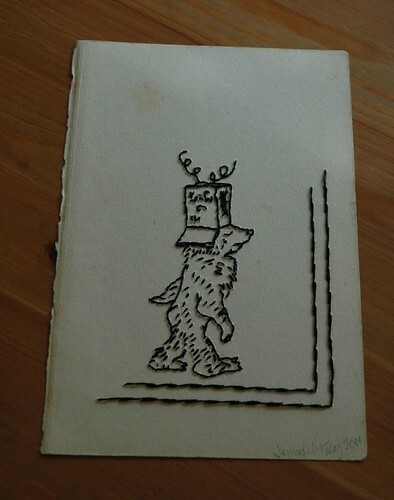 This swap’s theme was books and my partner expressed a fondness and a nostalgia for Little Bear. I’m really happy with this little guy. Even the reverse is nice (you can see where I erased a bit as I struggled with border options). As soon as I saw the expression on his face in the original Sendak illustration, I knew he was the one. I really love the borders throughout the book and was really torn when it became clear they were probably too intricate to effectively transform them to paper. It was my very last piece of yummy paper though. I’m going to have to hunt for more.